The Cell Services & Histology Core provides a full range of histology services, encompassing routine and specialized grossing, tissue processing, paraffin embedding, microtomy, H&E and special staining, and immunohistochemistry. Consultations are also available. 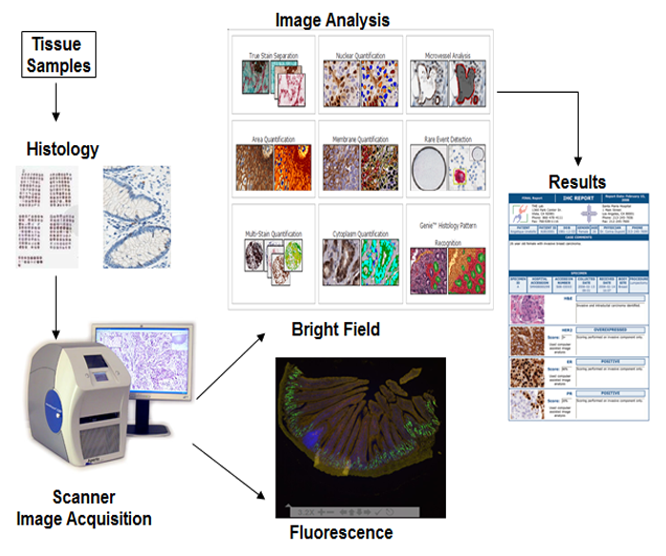 The core also offers image analysis through the Translational Pathology Laboratory (see figure). These services are available to CGIBD members and non-members. Digitized images can be accessed through a secure website. The investigators will have access to Aperio Imagescope software for annotation and scoring of images. Scanned images in the Spectrum Plus database can be shared with colleagues and viewed simultaneously. Investigators can request full (edit and annotate) or read only (read only) access for collaborators and others. The histology core has a Zeiss AX10 Imager and Zeiss AX10 Primo Star Microscope and an Olympus 1X81 inverted fluorescence microscope.